We’d love your help. Let us know what’s wrong with this preview of Freedom, Inc. by Brian M. Carney. To ask other readers questions about Freedom, Inc., please sign up. Be the first to ask a question about Freedom, Inc. I read this book after having read the book of Frederic Laloux "Reinventing Organizations". It seems those 2 have a lot of examples in common. Both books are quite inspiring and are hope giving when considering possible futures of labor and meaningful jobs. I must say reading this book made the work of Laloux somewhat less impressive as I think much of the work done here has just been copied by him. This book has the surplus advantage that it is less speculative. While Laloux tries to fit everyt I read this book after having read the book of Frederic Laloux "Reinventing Organizations". It seems those 2 have a lot of examples in common. Both books are quite inspiring and are hope giving when considering possible futures of labor and meaningful jobs. I must say reading this book made the work of Laloux somewhat less impressive as I think much of the work done here has just been copied by him. This book has the surplus advantage that it is less speculative. While Laloux tries to fit everything into a all encompassing evolutionary story, Carney does no such thing. It makes the book at the same time less awe inspiring and more believable. After reading this book I prefer the more down to earth approach of this book. One of the most inspiring books about management as empowerment of people that are skilled to create value to decide and take ownership. "Trust costs less than control"
The job of the manager is take care of people's future, they are skilled to manage the present by themselves. " The best non-fiction non-technical book I've read since "Influencer". Awesome. Knížka plná příběhů o liberálních leaderech, kteří se rozhodli vystoupit ze stojatých vod hierarchického managementu. Ukazuje jak řešit určité bolístky tradičních firem s hierarchickou struktůrou a zároveň to neprezentují jako všelék. Vše má své pro a proti a nakonec z toho vzejde (ostatně jako pokaždé), že je to víc o lidech. V knize je taktéž krásně popsáno proč liberalizační pokusy v korporacích selhávají, aneb je to změna, která vytvoří jinou firmu leč se stejným názvem. Ukazují s jakou lehko Knížka plná příběhů o liberálních leaderech, kteří se rozhodli vystoupit ze stojatých vod hierarchického managementu. Ukazuje jak řešit určité bolístky tradičních firem s hierarchickou struktůrou a zároveň to neprezentují jako všelék. Vše má své pro a proti a nakonec z toho vzejde (ostatně jako pokaždé), že je to víc o lidech. V knize je taktéž krásně popsáno proč liberalizační pokusy v korporacích selhávají, aneb je to změna, která vytvoří jinou firmu leč se stejným názvem. Ukazují s jakou lehkostí lze žít a tvořit firemní kultůru, která je spolutvořena a ne dána shora (třeba to taky znáte, takové to tady máš Code of Conduct, prostuduj, podepiš dodržuj). A really enlighting book about the company world. You will never see companies, and its workers, the same way. This book became instantly a reference to me after reading it. I highly recommend it! This review has been hidden because it contains spoilers. To view it, click here. Kniha popisuje rozdiel medzi firmami riadenými "Ako" - klasické firmy ako ich poznáme (hierarchická štruktúra, odmeny, rozhodovacia schopnosť manažérov). Proti nim stavia "Prečo" firmy s voľnejšou kultúrou so sklonom k sebamotivácii zamestnancov. Kniha ukazuje návod, ako vytvoriť firmu s prostredím, ktoré podnecuje zamestnancov k tomu, aby mali svoju prácu radi. Popisuje, ako sa v takto fungujúcich firmách správa management, supervízori, lídri - rovnoprávnosť s rádovými zamestnancami, načúvanie Kniha popisuje rozdiel medzi firmami riadenými "Ako" - klasické firmy ako ich poznáme (hierarchická štruktúra, odmeny, rozhodovacia schopnosť manažérov). Proti nim stavia "Prečo" firmy s voľnejšou kultúrou so sklonom k sebamotivácii zamestnancov. Kniha ukazuje návod, ako vytvoriť firmu s prostredím, ktoré podnecuje zamestnancov k tomu, aby mali svoju prácu radi. Popisuje, ako sa v takto fungujúcich firmách správa management, supervízori, lídri - rovnoprávnosť s rádovými zamestnancami, načúvanie potrebám, videnie v zamestnancoch hlavne to dobré, sloboda, vytvorenie sebemotivačného prostredia podnecujúceho produktivitu a schopnosť vymyslieť nové veci, ponúknutie možnosti vyslovenia svojich nápadov a v neposlednom rade hovorí o začleňovaní lídrov medzi rádových zamestnancov. "Freedom, Inc" is a book about charismatic leaders who took their companies through the process of freedom: organisation chart abolition, equality of rights and treatments among employees and human capital development. Very inspiring for managers and organization gurus. However, this is the sort of book that doesn't provide much more explanation than the article it came from. You can find this root article in the final section of the book, all the previous chapters are a mix of success stories. T "Freedom, Inc" is a book about charismatic leaders who took their companies through the process of freedom: organisation chart abolition, equality of rights and treatments among employees and human capital development. Very inspiring for managers and organization gurus. However, this is the sort of book that doesn't provide much more explanation than the article it came from. You can find this root article in the final section of the book, all the previous chapters are a mix of success stories. To me, they are too many, too much intertwined and quite redundant: a leader had the vision to free his company, explained to the authors how good he was to do it, the sort of difficulties he faced with and... that's it. Maybe a step-by-step methodology to implement freedom would have brought the complementary value missing in this book. Like many other books of this kind, there are a lot of stories, some more others less inspiring. All together it is a very good book and it is way's better than some others I have read about this subject. However, what I miss are the underlying principles, why freeing employees leads to higher productivity. Because if you have a closer look at this subject you will notice that this statement is not true for all businesses and all environments. Without an explanation of this principles that are mu Like many other books of this kind, there are a lot of stories, some more others less inspiring. All together it is a very good book and it is way's better than some others I have read about this subject. This book is the outcome of a long research, but it's delivered as a series of stories telling, interviews and analysis. It's all about seeing and managing companies in a very different ways. It's disruptive. So much disruptive that many companies claim to go this way without understanding the consequences. The book is hard to summarize. It's an easy and inspirational read. A very good book, but quite surprised to find that it shares 75% of its examples/cases/stories with Laloux' Reinventing Organisations, yet it was written a few years before it. Even more surprised never to have come across comments regarding this. Basically, the same main characters (Favi, Sun, Harley...), the same anecdotes, but structured in a different way. Didn't mind reading them again, and still hoping to participate in spreading this word! 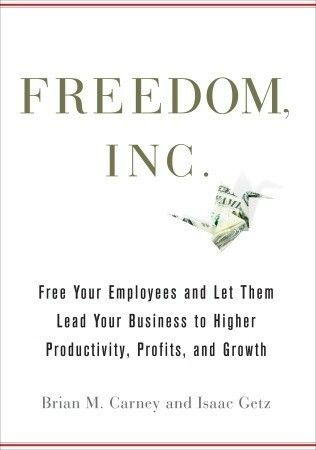 Excellent book on how to utilize the principles of freedom in the business environment to allow your employees to maximize their potential and achieve rewarding results for themselves and the business. Many great examples and tools from leading companies that have embraced Freedom and respect for the individual as their guiding principles. Highly recommended! I love this book to bits. I always thought something like this would work and as a HR person I want to help to make this happen in more companies around here. Podivín a Štěstí doručeno mě bavilo víc, ale tohle mělo širší záběr a dostal se mi obraz svobody v práci v souvislostech. Určitě doporučuju si tuhle knížku z trilogie Peoplecommu nechat na konec. It's great to see empowerment back in vogue. Good stories based on interviews, lots of valuable lessons. It will definitively change me and I hope help me transform enterprise for the better.